it is time that you elevate your awesome and step into your spotlight so that you can build your audience, boost your sales and leave your audience begging for more. 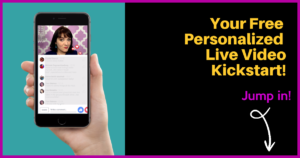 You may know Facebook live is an amazingly powerful tool that will put you contact with those who need you most. However, it can be difficult to know how to truly use it powerfully. I'm thrilled to be offering opening time for a 45 min Live Video Kickstart Strategy Session. If you think you have what it takes to really step it up, I'd love to provide a boost of Confidence, Performance Skills, DIY Camera Set Design and a Powerful Plan backed by super ninja live video repurposing tricks that I have developed so that your live videos will continue to work for you long after they have ended. I'm only setting this time aside for a few stellar business owners who are really ready to invest in making a big change happen. Apply ASAP if you think you are a good fit. I'll get back to you within 24 hours to set up a time to chat. If the form below isn't working, click here!